Welcome to our hypertext project. 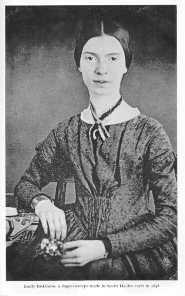 Below is a brief biography of Emily Dickinson. Also there are related links to more information and on seperate pages we have three poems. The poems are taken apart and analyzed. Emily was born and lived all her life in Amherst, Massachusetts. Although her early years were filled with the normal social activities of the daughter of a prominent citizen, she began to withdraw from the world outside her home. By the age of thirty she became an almost total recluse, never leaving her father's house and garden, dressing completely in white, receiving very few visitors, and carrying on most of her many fiendships through a regular correspondence. Only seven of her poems were published in her lifetime. After her death, her sister Lavinia found over a thousand poems in her room, all bound neatly in home-made booklets. Almost all were short lyrics; most were untitled and undated; some appeared in several versions. When her work was later released it had changed metres and rhymes, altered metaphors, and substituted conventional grammar for the original complex syntax. These various links may prove helpful in your own quest for information about Emily Dickinson. Emily Dickinson by John Ravert - This site is not necessarily well designed, but it has a lot of information about Emily Dickinson.